What’s the difference between technology-adoption, technology-evolution and lifecycle-management? That’s a question that’s come up recently for me, in part as a follow-up to my recent post ‘Technology-adoption, Wardley-maps and Bimodal-IT‘. Probably best to backtrack a bit here? First, we need to understand the term ‘technology’ in its broadest sense: not just some physical machine or IT-box, but all the processes, skills and the rest that are needed to make those machines and boxes not only work, but be useful in their working. 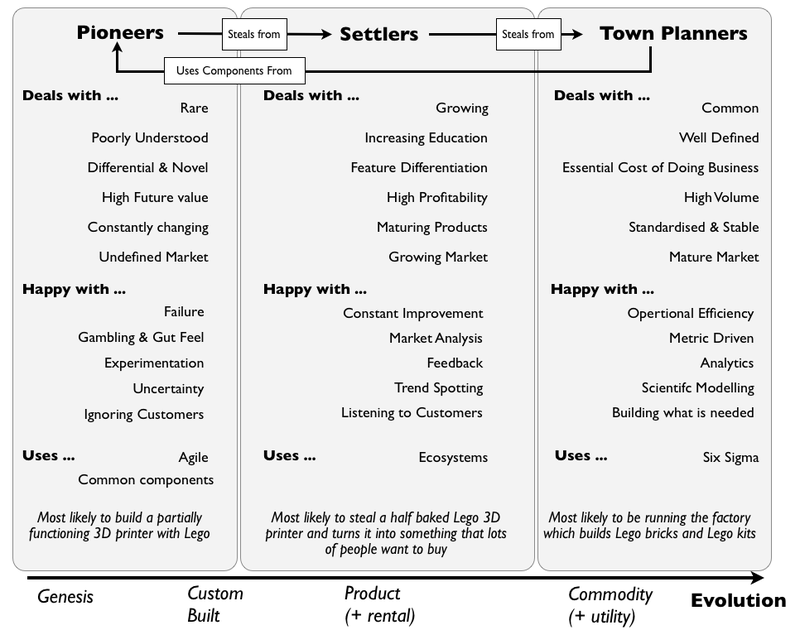 In Wardley’s models, the PST relationships are about how to handle technology-evolution – the way in which the implementations of a given technology tend to evolve over time from initial genesis, to custom-built in-house, to off-the shelf or rented product, to outsourced commodity or service. 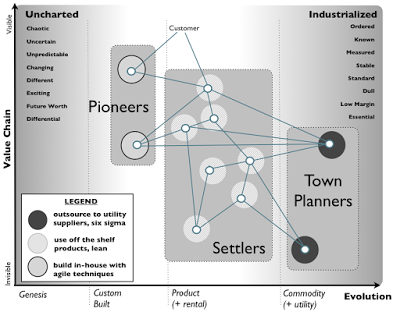 To support a strategy, we need the right mix of Pioneers, Settlers and Town-Planners, guiding and governing the usage of the full set of technologies in use within that strategy and value-chain, and passing each technology from one to the next as the strategy and technologies themselves evolve over time. we need an additional distinct role for Stayers to manage end-of-lifecycle activities. It’s perhaps most in that sense that the two ‘bleeding edges’ have so much in common: the Pioneers are exploring the new, whilst the Stayers are re-exploring the old. The passion that drives people to invent – ‘scratching an itch’, to use Richard Stallman’s famous phrase – is very similar to that which drives people to rebuild classic cars, to maintain rare-breeds of animals and plants, to recreate historical costumes and events, or to rediscover the virtues of vinyl or photographic film. For the Exploiters, a stronger emphasis on the short-term is actually what we want: if we allow the focus to stray too far away from the Now, everything slows down, and cost/benefit balance may well shift back into unprofitability. 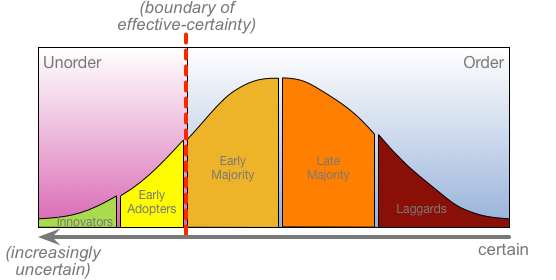 Yet it does all need to be in balance, and – as in the diagram above – there needs to be explicit planning for acquisition and implementation of any new technology, and proper preparation for sunset and end-of-life, providing clear and managed transitions throughout the whole technology-lifecycle. The above is what happens when we have the full cycle in balance: in particular, the Exploiters exploit the respective technology in a way that creates the greatest return, yet also fully in context of the larger picture. First, the respective organisation abandons any attempt at doing its own innovation – usually on the basis that it’s too difficult and too expensive, with no immediate returns. Instead, all of that is reframed as Somebody Else’s Problem, and is outsourced, usually as ‘meme-copying‘ or ‘solutioneering’ via some big-consultancy or other large provider of pseudo-certainty: “our clients demand a future that is fully proven”, as one large-firm consultant put it. 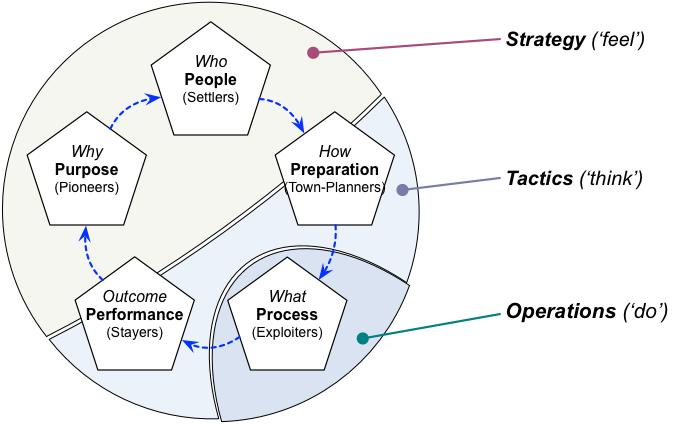 The active Town-Planner role is replaced by the largely-passive Buyer, whose sole aim is to outsource all responsibility, strategy and thought. But without any internal means of access to the inventiveness of the Pioneers, or the careful realism of the Settlers, this creates a dangerous dependence on external providers – a dependence that, to be blunt, too often resembles the poisonous relationship between drug-pusher and ‘user’. 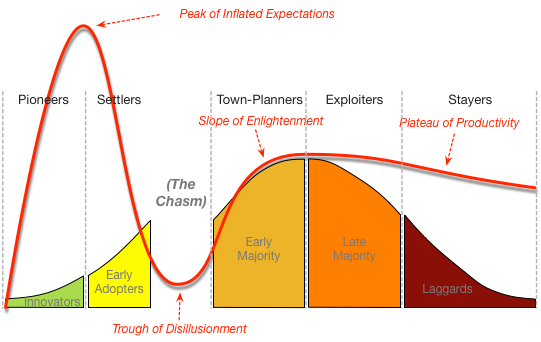 Even at best, the Buyer is often like a kid let loose in a toy-store, rushing endlessly from one ill-thought-through management-fad to the next, in a feverishly hype-fuelled yet inherently-futile quest for the One True Solution That Will Finally Fix Everything And Enforce Competitive Advantage Forever. 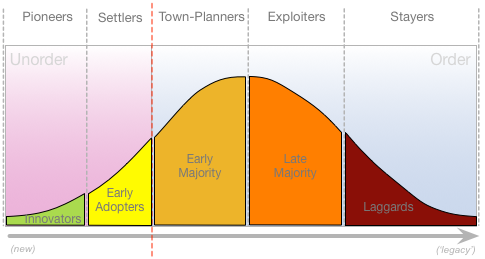 Which brings us to the Exploiters – who, in this scenario, are required to take on whatever the Buyers give them, and then all-too-literally exploit and exploit, ‘sweating the assets’ with the maximum ‘efficiency’ and speed, regardless of any damage doing so may cause (and which, again, is deemed to be Somebody Else’s Problem). Short-term profit is all that matters – no focus on anything else, or often even any awareness of anything else. And there is no end-of-life planning. Instead, once the technology breaks down beyond the reach of a quick-and-dirty repair, it is simply abandoned, and replaced by the next shiny new toy. In effect, it becomes ‘anti-property‘ that somehow, once again, is magically reframed as Somebody Else’s Problem. Or, in this case, as a challenge for the respective Stayers, who salvage whatever they can from the wreckage. Even so, the overall costs of repair and recovery can often far exceed the gains that were made by the Buyer/Exploiter pairing – as can be seen all too graphically, for example, in the environmental-disaster-zones that surround so many former mines and their abandoned ghost-towns. Not exactly a happy scenario, this one, but still depressingly common in business and elsewhere – especially where parasites and predators rule the show. Not A Good Idea…? 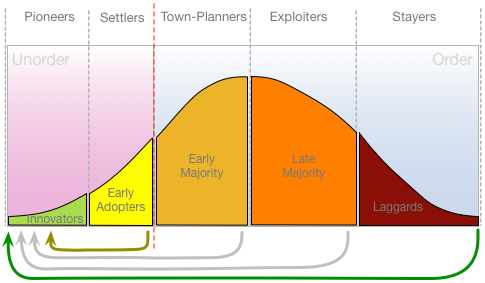 The key point here is that technology-adoption is only viable in context of the whole technology-lifecycle: not the dysfunctional Buyer/Exploiter pairing, but the full set of Pioneers, Settlers, Town-Planners, Exploiters and Stayers for the respective technology. 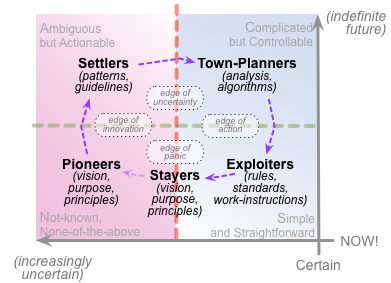 In practice, this means that for each technology in use, or intended for use, within the organisation – whether in strategy, business-model, operating-model or beyond – we need the full skillsets for each of those roles, accessible either somewhere within the organisation, or elsewhere in the broader shared-enterprise. This doesn’t mean that we have to have all of those skills, present at all times: what it does mean is that we need to know where to find those skills, and to maintain enough skills and knowledge in-house to be able to make full sense of each technology and its needs. Architecturally speaking, over-reliance on external ‘solution’-providers is a recipe for organisational-suicide. Hence, for an architecture-roadmap or suchlike, we need to map out not just the technologies in use, but the full set of skillsets and knowledge required for development, pre-use validation, implementation, operation and end-of-life closure for each technology. (Often these will require systematic attention to ‘architecting the shadows‘, at both ends of the technology-adoption lifecycle.) It’s only when all of those are properly covered, somewhere within the roadmap, that we would have a viable architecture, and hence a viable business-model and/or operating-model. As usual, the greatest architecture-challenges are likely not to be in the technical domains, but in the human ones – in particular, in the politics of strategy-development. Even at the enterprise-architecture level, few architects get the opportunity to define an organisation’s strategy – but we still remain responsible for making sure that it works. We need to find ways to influence our strategy stakeholders, to ensure that the full technology-lifecycle is properly covered in each case. For example, we need to make it clear that many classic business-models could be made to seem ‘viable’ and profitable only by ignoring a whole swathe of externalities – and with the onset of much greater enforcement of transparency in business, government and elsewhere, pushing those impacts back onto their creators, the apparent profitability of a dysfunctional business-model can evaporate overnight. In a full whole-of-enterprise architecture, there is no such thing as ‘Somebody Else’s Problem’ – and until this fact fully sinks in, the hidden risks for strategy can be very high indeed. For architects, probably the hardest task of all will be to dissuade executives and others from falling into the Buyer/Exploiter trap. That trap can be very profitable, in the short-term, for outsiders – particularly vendors and some types of shareholder – but it has a high risk of becoming very expensive indeed for the organisation itself. Given the huge pressures that push everyone towards simplistic ‘solutions’ that don’t and can’t work – especially over the longer term – then yes, this one’s never going to be easy: but we do need to fight against it as best we can. A proper understanding of the real technology-lifecycle, as above, should probably help in that. Enough on this for now, I guess: over to you for comments and suchlike, perhaps?